The Farquhar College of Arts and Sciences Division of Social and Behavioral Sciences welcomed Philip G. Zimbardo, Ph.D., professor emeritus of psychology at Stanford University, as part of the college's Distinguished Speakers Series on Thursday, April 15, 2010, in the Arena at the Don Taft University Center. Zimbardo presented a talk titled "The Lucifer Effect: Understanding How Good People Turn Evil." Zimbardo is an internationally renowned scholar, professor, writer, and researcher known as the "voice and face of contemporary American psychology." He is the host of the PBS television series Discovering Psychology, an instructional video collection widely used by high school and college students and teachers across the globe. 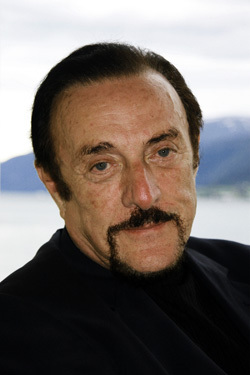 Zimbardo has taught psychology at Stanford for more than 40 years, previously teaching at Yale University, New York University, and Columbia University. He also currently teaches at Palo Alto University and the Naval Postgraduate School, both located in California. Though Zimbardo is the author of more than 400 professional publications and 50 books, he is perhaps most known for his 1971 Stanford Prison Experiment, which studied the physical and psychological effects of power and examined how otherwise "good" people can turn "evil" when placed in certain situations. In the experiment-which was scheduled to span two weeks but had to be stopped in only six days-a group of 24 student volunteers were divided, 12 named "prison guards" and the others "prisoners," and placed in a functional yet simulated prison environment, constructed in the halls and surrounding "yard" of the Stanford Psychology Building. The "prisoners" were detained, arrested, and placed in the mock prison through a series of realistic procedures. The "guards" received power and the freedom to control the prison/prisoners as they saw necessary. The experiment began with nine prisoners and nine guards, with the remaining volunteers standing by "on call." Though the first day passed with little sign of confrontation on either side, a riot broke out the next morning-the result of a rebellion by the prisoners. The guards responded with force. According to the study, "the guards broke into each cell, stripped the prisoners naked, took the beds out, forced the ringleaders of the prisoner rebellion into solitary confinement, and generally began to harass and intimidate the prisoners." To regain control of the prison, the guards soon resorted to psychological (not necessarily physical) abuse, which eventually led to authentic emotional trauma for the prisoners. Talk of a rumored escape plan soon surfaced, but never materialized. After suffering four days of abuse, the prisoners came up for "parole" and pleaded for their release from the prison-even agreeing to forfeit their financial earnings from the experiment in exchange for their "freedom." Zimbardo and his researchers realized just how real the experiment had become and the resounding impact it had left on the volunteers. By the fifth night, the line between fantasy and reality had been blurred completely. Parents of the students contacted Zimbardo and requested lawyers to aid in the release of the volunteers. According to Zimbardo, it had become clear "that we had to end the study" prematurely. "We had created an overwhelmingly powerful situation-a situation in which prisoners were withdrawing and behaving in pathological ways, and in which some of the guards were behaving sadistically," Zimbardo said. "Even the 'good' guards felt helpless to intervene, and none of the guards quit while the study was in progress. Indeed, it should be noted that no guard ever came late for his shift, called in sick, left early, or demanded extra pay for overtime work." In 2007, Zimbardo released The Lucifer Effect: Understanding How Good People Turn Evil, in which he compares the prison experiment to the recent documented prisoner abuse at Iraq's Abu Ghraib prison (since renamed Baghdad Central Prison). The Lucifer Effect became a New York Times best-seller and received the William James Prize for book of the year. Zimbardo's breadth of publications explores his research interests in social psychology, ranging from topics of shyness, time perspective, cults, and political psychology to madness, torture, terrorism, and evil. He also is the noted author of the oldest current textbook for psychology, Psychology and Life, now in its 19th edition. As a representative of the field of psychology, Zimbardo is the past president of the American Psychological Association and the Western Psychological Association and has served as chair of the Council of Scientific Society Presidents (CSSP). Though retired, Zimbardo still also serves as the executive director of Stanford's Center for Interdisciplinary Policy, Education, and Research on Terrorism (CIPERT). Photos from this Distinguished Speakers Series event are available in the college's Photo Gallery.